In our area, we only have one type of kingbird - the Eastern Kingbird. We have some that hang out in our yard in the Villas which is really cool. Occasionally, other types of kingbirds show up which gets the birders excited. 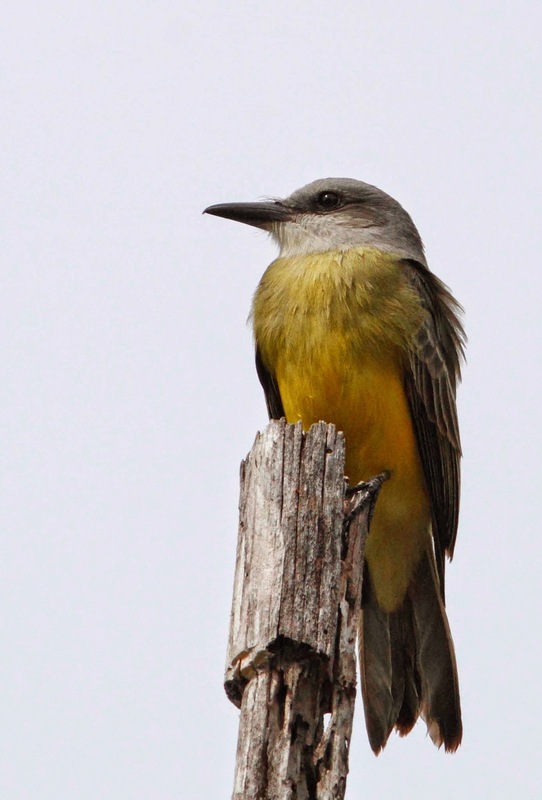 The story changes when you go south and west where there are several types of kingbirds. Once you get south of the border there are even more choices - and they start to all look the same. Take these three for example. All three have gray heads, yellow bellies and some sort of light under the chin but they also have some differences. First up - this bird has a gray bib that extends pretty far down the chest. The tail is partially obscured by the wire but it looks kind of notched. Something weird is going on with the front of this bird too. Is it the same as the bird above? Not as much white under the chin either. What about that tail? Is is flat or round or notched? The final bird also has some smudgy stuff on the chest and definitely has a white chin. It also has a definite notch in the tail. 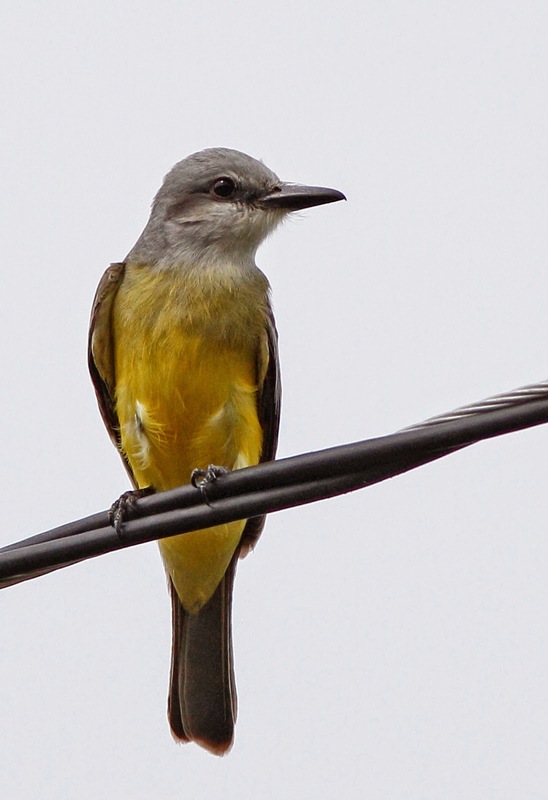 So, I would guess that #1 is Western Kingbird due to the light throat and breast. 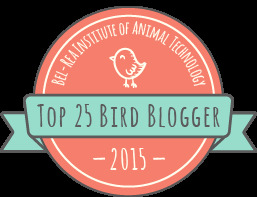 Although #2 and #3 are not the same bird, I think they are both Tropical Kingbirds. Of course, I could be wrong. 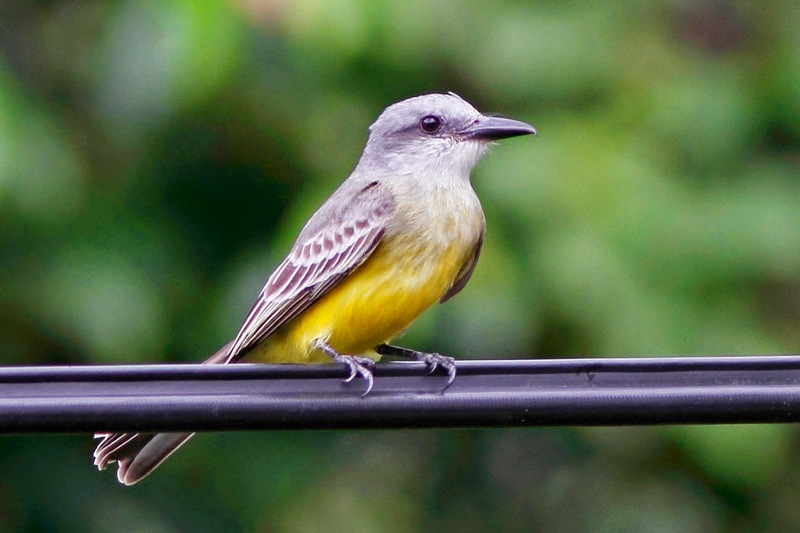 Some of the experts in our area call the vagrant kingbirds "yellow bellied" at first until they have a chance to review their own photos.